In terms of defending the homeland from Kim Jong-un, President Trump’s risk calculus is spot-on. The portrayals of both North Korean leader Kim Jong-un and U.S. president Donald Trump as bombastic egoists reacting emotionally seem to have become hackneyed as tensions continue to rise on the Korean Peninsula. But reducing the sophomoric rhetoric between the two men to mere chauvinistic posturing fails to reveal the genius underlying the Trump administration’s pressure campaign. President Trump’s tweets, while drawing the ire of both sides of the aisle, shatter the North Korean image of Kim Jong-un and force him to react from a position of weakness on terms dictated by the United States. To understand why Trump’s rhetoric is so effective, one must consider the president’s target audience. Kim Jong-un spent his early life in Switzerland, and was thrust into the spotlight prematurely due both to his father’s death and to the various inadequacies and indiscretions rendering his two elder brothers unfit to lead. To compensate for the twentysomething’s inexperience and lack of notoriety, North Korean officials began a relentless campaign to create the supreme myth of their new supreme leader. In an effort to reverse the growing resentment towards senior leaders brought on by his father’s reclusiveness and the memory of the terrible famine of the 1990s, through which the current generation came of age, Kim Jong-un was modeled as the reincarnation of his grandfather, Kim Il-sung. Prior to taking power, the younger Kim attended the Kim Il-sung Military Academy to establish his military bona fides before being commissioned a four-star general and named vice chairman of the Central Military Commission. The myth exaggerated Kim Jong-un’s military prowess through the Pyongyang propaganda machine, which has been a continuous font of photos appearing to show him planning military movements, videos in which he is instructing his generals, and fiery statements defending the Korean people against the acrimonious Americans and their South Korean puppet. There are even intimations that the shelling of South Korea’s Yeonpyeong Island and the sinking of the Republic of Korea Navy vessel Cheonan in 2010 were attributed to Kim as a means of increasing his credibility. Much like his grandfather, this overweight, jolly and ever-smiling leader frequently appears in public for engagements and meetings with the Korean people, and to personally deliver orders to his military forces in the field—something his father, Kim Jong-il, who is said to have suffered from a severe stutter, rarely did. To further distance himself from the anathema of his father’s legacy, the young leader embarked on a savage campaign of over three hundred executions to rid his regime of Kim Jong-il’s inner circle. His eradication of senior leaders, while seen from the outside as a sign of paranoia, may have served the greater purpose of separating him from the taciturn and corrupt regime of his father in the minds of the rising generation of North Koreans. Having been educated in Switzerland, traveled extensively abroad and studied China’s rise to prosperity, Kim Jong-un is keenly aware of the precarious summit on which he sits. The North Korean black market consists of a capitalistic network of illicit goods smuggled in from China and other neighboring countries. While smuggling in North Korea is punishable by death, it has been largely ignored by Kim Jong-un’s regime. One likely reason for this is Kim’s understanding of the necessity to control the transformation of North Korea from a socialist state with a command market to a dictatorial capitalist economy that trades on the global market. In order for Kim to remain in power, he needs both to foster an underground economy so as to establish a memory of capitalism and to reinforce his command of the military to thwart any would-be mutineers. By conducting more than twenty ballistic-missile launches and two nuclear detonations this year while keeping his military constantly on a wartime footing, Kim sustains his tyrannical control throughout the ranks while appearing to be much the same hawkish defender of the fatherland his grandfather was. By allowing capitalism to survive in the shadows, he maintains control over the gradual ascendance of a centrally managed market economy in the same vein as the pioneer of China’s economic awakening, Deng Xiaoping. What Kim Jong-un needs is time and money. Revamping North Korea’s society and economy while maintaining control over international influence inside the hermit kingdom is a delicate task. Opening China to the global market took Deng Xiaoping eleven years of adroit political maneuvering and significant foreign direct investment by Western corporations to achieve his “Four Modernizations” in the agricultural, industrial, science-and-technology and military sectors. As sanctions linked to United Nations Security Council Resolution (UNSCR) 2375 sanctions begin to tighten the noose around the neck of the North Korean economy, Kim Jong-un is looking for alternative revenue streams to keep his economy afloat. Recent cyber activities link the Lazarus Group, North Korean–backed cyber actors, with various crimes. Those crimes include the WannaCry ransomware attack affecting over 150 countries, a Bangladeshi bank heist in which thieves absconded with over $81 million and, most recently, the theft of over $60 million from the Taiwan Far Eastern International Bank. This pervasive and increasing state-sponsored cybercrime for financial gain indicates the North Korean government is seeking alternative forms of revenue to augment its stagnant economy. With UN sanctions taking their toll, these activities will likely become more prevalent as North Korea continues to seek funding to expand its nuclear and cyber capabilities. Yong Suk Lee, deputy assistant director of the CIA’s Korea Mission Center, described North Korea as a “political organism that thrives on confrontation.” Historically, confrontation and the threat of nuclear war have united the North Korean people behind their leaders and brought the international community to the negotiating table, yielding both time and money for Pyongyang. The Trump administration’s all-or-nothing approach to North Korea’s nuclear and ballistic-missile ambitions is forcing Kim Jong-un into a corner from which he only has two choices: further escalate tensions or withdraw his primary bargaining chip. In order for Kim to continue appearing strong to the North Korean people and to the international community, he will need to continuously increase his rhetoric and back it with action. Ultimately, Kim Jong-un wants three things: for North Korea to be treated as an equal on the world stage by the United States and China, to usher in the incipient capitalist economy on his terms, and, above all, to retain power. However, in order for him to achieve these goals, he needs support from China to keep the United States at bay. But China, weary of playing peacekeeper between North Korea and the civilized world, has yet to play its trump card. On July 11, 1961, China and North Korea signed the Sino-North Korean Mutual Aid and Cooperation Friendship Treaty, which requires both nations to oppose any country or coalition seeking to harm the other. North Korea holds this treaty to be the guarantor of Chinese protection. China, however, could use North Korea’s belligerence to nullify the treaty. Article 1 states that each contracting party shall “make every effort to safeguard the peace of Asia and the world and the security of all peoples.” If North Korea strikes first, China will be forced to renege on the treaty or face international censure. If this happens, the Democratic People’s Republic of Korea will, for the first time in its history, find itself truly isolated. China, in a last-ditch effort to rein in its wayward ally, has already violated—perhaps as a threat—Article 3 of the treaty by signing UNSCR 2375 on September 11. Article 3 states that “neither contracting party shall conclude any alliance . . . [n]or take part in any bloc . . . directed against the other.” By imposing limits on oil exports to North Korea, banning imports of North Korean textiles, and limiting North Korean labor abroad, Beijing sent a clear cease-and-desist message to Pyongyang. The Trump administration’s incessant and boisterous pressure campaign has forced Kim’s hand in crossing an internationally accepted code of conduct. These breaches of protocol—specifically, the testing of a thermonuclear weapon and two iterative ballistic-missile launches over Japan—require China to condemn Pyongyang’s actions. Without China’s protective umbrella, Kim is finding himself ever more exposed and contemplative of his next move. And this is the brilliance of the Trump administration’s approach. Both North Korea and China are being backed into a corner before North Korea possesses the ability to strike the U.S. mainland with a nuclear weapon. If Kim Jong-un were to launch a ballistic-missile strike against South Korea or Guam, then he would be signing his own death warrant and inviting the full force of a trilateral strike from the United States, South Korea and Japan while China is forcibly sidelined. In terms of defending the homeland, President Trump’s risk calculus is spot-on. How far will Kim go? Keeping in mind Kim’s three prerogatives, test-launching a nuclear-tipped ballistic missile is not in keeping with his survivalist aims. Because President Trump has never articulated his red lines, Kim Jong-un has no clear understanding of what will bring upon the wrath of the U.S.-led coalition. A nuclear test over the Pacific Ocean could give President Trump the justification to order a preemptive decapitating strike against Pyongyang—and following such a significant escalation by North Korea, Beijing likely would do little to interfere. Kim Jong-un is unlikely to risk his dynasty in retort to President Trump’s statements just to show his prowess. At the same time, Kim has seen what happens to world leaders who cede their nuclear ambitions—Libya, Ukraine and Iraq provide stark reminders of where that road leads. And now, Kim is ostensibly achieving one of his goals: nuclear weapons and cyber warfare have brought North Korea to the center of the world stage. He will not easily relinquish his bargaining chip. So for the time being, North Korea and the United States are locked in a stalemate. The key to a peaceful resolution is China. Nearly 80 percent of all black-market products in North Korea come from China. Without this flow of illicit items, the North Korean “free” markets come to a standstill. Additionally, Chinese and Russian telecom companies provide the only links between North Korean cyber actors and their targets. In order to truly cripple Kim Jong-un, the Trump administration needs to persuade China to cut off North Korea’s access to both black-market items and the internet. Without web access, Kim loses the revenue stream provided by his cyber army. President Trump’s fiery rhetoric has emptied Pyongyang’s hourglass; now is the time to empty its coffers. The added benefit of cutting North Korea off from the internet is removing its only real threat to the U.S. homeland: cyber warfare. At this point, Kim has the ability to launch a cyberattack against the United States without fear of international condemnation and the certain reprisal that would come with a kinetic strike. Remove that option, and Kim is left with the choice to capitulate and negotiate, or to continue launching his missiles and stand alone against the fury of the United States. In order for North Korea to come to the negotiating table and be treated as an equal by China and the United States, Kim Jong-un needs to take positive steps to defuse tensions. To do this without appearing weak to his populous or to his military is no easy task; however, Kim Jong-un has an opportunity to signal he is ready to make that leap. Without nuclear disarmament, the threat Pyongyang poses to Seoul is too great for the United States to allow. 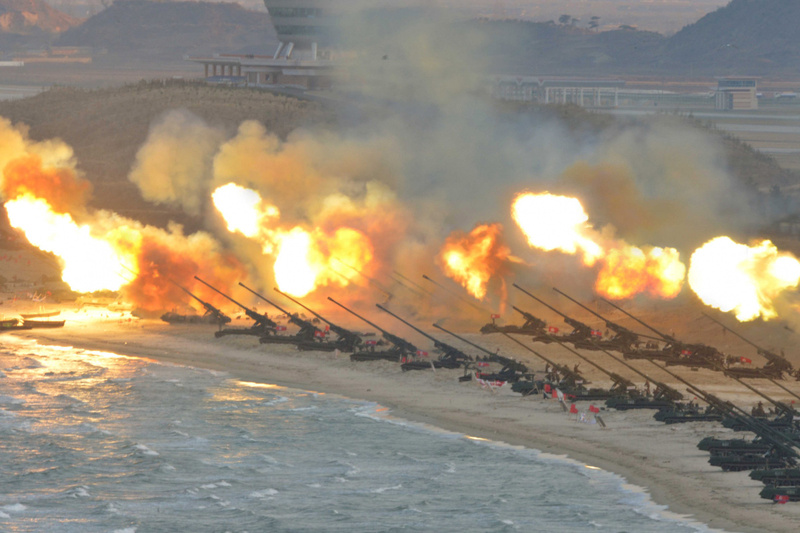 On the other hand, even without a nuclear weapon, the amount of artillery North Korea has amassed along the Demilitarized Zone could kill hundreds of thousands of South Koreans. If North Korea alters its current collision course, then Kim’s propaganda machine may be able to portray him as the great protector of North Korea while de-escalating tensions internationally. But such a feat could only be achieved if Kim ordered a pause to ballistic-missile tests and opted instead to conduct a major military exercise focusing on offensive artillery drills. This type of positive step could signal Pyongyang’s willingness to begin negotiations. However, until North Korea takes that first step towards a peaceful resolution, the Trump administration’s antagonistic approach before North Korea has the ability to detonate a nuclear warhead over the United States is America’s best avenue to ensure U.S. national security. Michael McLaughlin is a Naval Intelligence Officer at United States Cyber Command. His foreign tours of duty include multiple postings to the Far East, the Middle East and Europe. The views and opinions expressed in this paper and/or its images are those of the author alone and do not reflect the official policy or position of the U.S. Department of Defense (DoD), U.S. CYBERCOM, or any agency of the U.S. government. Any appearance of DoD visual information or reference to its entities herein does not imply or constitute DoD endorsement of this authored work, means of delivery, publication, transmission, or broadcast.